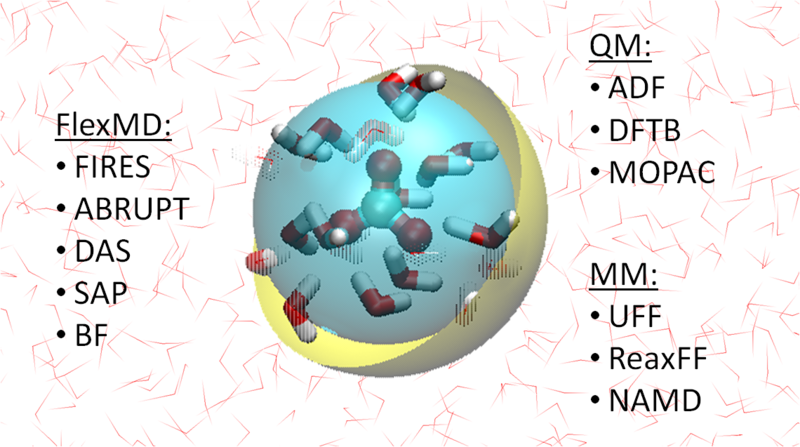 Accurate modeling of chemical reactions in realistic aqueous environments calls for an efficient multi-scale quantum mechanical/molecular mechanical (QM/MM) approach. However, since solvent molecules diffuse in and out of the region of interest, new adaptive approaches beyond traditional static QM/MM boundaries are necessary. A small, but fast growing set of approaches has emerged over the recent years, but it is hard for potential users to understand the advantages and drawbacks of each method and as such to select an appropriate method for their purpose. In a recent paper, five different methods (FIRES, ABRUPT, DAS, SAP, and BF) are critically evaluated, and guidelines are outlined for the setup of customized multi-scale simulations of aqueous processes. The FlexMD interface provides a python interface for setting up these adaptive QM/MM calculations with different modules in the ADF molecular modeling suite (ADF, DFTB, MOPAC, ReaxFF, UFF) and with NAMD.